This dilemma is obviously a perfect match for the Prejudice and Politics deck. 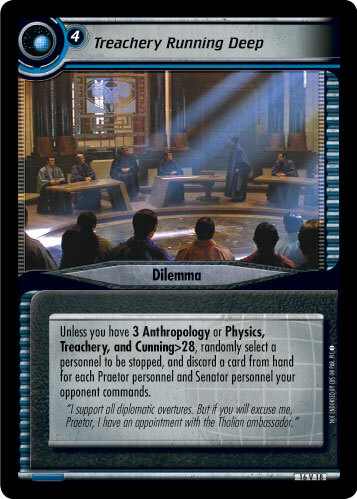 You've already got a couple of personnel with the appropriate keywords in your deck, and you're already messing with your opponent's resources (as Romulans are so apt to do), so why not throw this in your dilemma pile as well? With eight different personnel (including a non-unique one-cost Senator), you can get up to ten keywords in play (eleven with Martia), so it shouldn't be too hard for this dilemma to blow away your opponent's entire hand in one go. Now, obviously, this combines well with cards like Under Scrutiny, and other cards that either force discards (as an effect), or require discards (as a cost). But why just look at your draw deck when trying to find ways for your Romulans to mess with your opponent's hand? Remember, we're trying to shake up your dilemma piles here! So how does this card do it? Telepathic Invasion is the other Romulan-specific dilemma, and again it helps to shrink your opponent's hand. The Dreamer and the Dream is another dilemma that will discard your opponent's entire hand if he or she can't complete the mission on time. The Three Vipers will gradually force discards, which means if your opponent wants to keep his hand size up, he's spending a lot more time drawing cards and not much playing them. And why are we so focused on getting rid of an opponent's hand? Well, obviously, if they've got no hand, they've got less resources from which to play cards. It'll slow their game down, and give you more time to win. But it can be so much more than just that! Continuing to focus your dilemma pile around this theme, you'll find that it's getting a lot more powerful once your opponent has a small, or empty hand. Gorgan... forget a choice stop, this one can stop an entire mission team if your opponent has got no hand left! Hired Muscle requires three discards... what are the odds that your opponent can afford to keep three cards in hand when you keep discarding his hand? On Foreign Ground... if your opponent has no hand, he can't stop the kill. And if he does have a hand and wants to stop the kill, then he has to discard his entire hand. Either way, you win! Revelry is another card that can only be avoided by some specific discards from hand... discards that your opponent probably won't be able to fulfill after his hand has been decimated! Stolen Computer Core has more discarding requirements, but might not fit well in this dilemma deck because there isn't a lot of Programming called for on any of the dilemmas. But it still gets an honourable mention, in case the opponent is playing with Programming-requiring space missions. As you can see, it should be fairly easy for the Romulans to build a dilemma pile entirely around this new dilemma. So why would you want to move your single dilemma pile back and forth between all your decks, when building a custom dilemma pile for each decktype can be so much more fun? Next time... what happens when your boss doesn't believe you? And just how many bosses is a poor guy expected to report to?